Saturday Farm Photos: Flying in to Wish You Happy Halloween! Where Did that Creek Come From? © Copyright 2009 FarmgirlFare.com, the flash flowing foodie farm blog where there's nothing like hiking out for a day of grazing in the far field and then finding a rushing stream of water has suddenly appeared between you and the barn (okay, maybe it wasn't exactly rushing, but still). Fortunately everyone is now safely back where they belong, the two loaves and dozen rolls of Honey Bran Whole Wheat I was in the middle of baking during all of this unexpected excitement didn't overrise, burn, or otherwise become inedible (though I did forget to grease the loaf pans—bummer), and I've now been thoroughly reminded that the big crack in one of my beloved rubber boots is even bigger than it was the last time the creek was up—and I never did get around to buying that replacement pair. At the Camera: Attacked by The Donkettes! © Copyright 2009 FarmgirlFare.com, the no zoom lens here foodie farm blog where our photos never lie, but they might not always show you the entire picture. Hallelujah! Six of the eight baby chicks born back in April turned out to be hens! They should start laying soon, which will then more than double our current egg output. Usually our hen to rooster hatching ratio is the other way around (and we really only need one Rooster Daddy on the farm), but this time the egg-laying odds were definitely in our favor. Maybe it was all that pizza. © Copyright FarmgirlFare.com, the fine feathered feminine foodie farm blog where grown up chickens are still considered cute, right? And if they're not, then you can break the news to Whitey, who, at nearly 10 years old, now has her eye on making it into the Guinness Book of World Records as the Oldest Living Chicken. She and her attitude are doing just fine, and she definitely still considers herself cute (she just hasn't posed for any photos—or had any more longings for motherhood—lately). © Copyright 2009 FarmgirlFare.com, the sunny, breezy, and beautiful foodie farm blog where this is the perfect kind of autumn day to wash a whole bunch of laundry, dig out the winter hats and jackets and scarves, and celebrate one of our most prized posessions—the clothesline. Need to chill out a little more? Very ripe pears are the secret to this flavorful, foolproof pear butter that will keep in the refrigerator for a few weeks and also freezes well. No canning required! After going through about 70 pounds of pears while working on the cookbook-that-isn't-going-to-be, I came to a couple of conclusions. The first is that pears just might be even more versatile than apples. 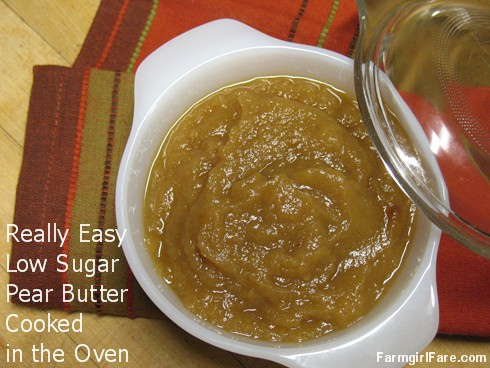 The second is that homemade pear butter is one of the most wonderful things on the planet. It also happens to be extremely easy to make. One of my biggest pet peeves—which, as my hunky farmguy Joe can tell you, I've mentioned about 5,000 times—is the vast amount of sugar that so many preserving recipes call for. One cup of fruit to one cup of sugar? Why? Fresh seasonal fruit is so sweet on its own. The other day I actually saw a recipe for strawberry jam that used two cups of sugar for every one cup of fruit. My teeth hurt just thinking about it. I make a one minute raspberry 'jam' that doesn't have anything in it but fruit. She's Finally Growing into Her Ears—and Bright Pink Nose! © Copyright 2009 FarmgirlFare.com, the we only use real sheep, not professional models foodie farm blog where neither the mother nor the father of this cutie pie sport any black spots whatsoever, and it looks as if somebody splattered their fountain pen next to her little baby face—except for the fact that her spots just keep getting bigger. 10/6/06: Baby Cary is Five Months Old Today! So far Daphne's baby boy (who still hasn't been given his 'F' name! I've been leaning toward Fernando but haven't quite decided yet) is the only donkey we've had born on the farm this year. That may change very soon, however, since Dolores—who we thought had miscarried during the winter—is now huge. Judging by how much this little guy loves to chase, gnaw on, and generally torment (in a little brother kind of way) his big sister Evie (who doesn't have any interest in playing with him), I know he'll be thrilled if a new playmate shows up. Want to see more baby donkey cuteness? © Copyright 2009 FarmgirlFare.com, the longeared foodie farm blog where what started as one little donkey has now turned into six—and if I can get them to start eating the dreaded cactus that is taking over the farm even faster than the donkeys are, I've been told by my hunky farmguy (and resident cactus hater) that a herd of 100 would be more than welcome! © Copyright 2009 FarmgirlFare.com, the kick back with your hooves and paws up foodie farm blog where Daisy, who is actually resting just a few feet from her two-factioned flock in the farmyard, only looks as if she's completely off duty (and dead to the world). One strange little noise and she'll be all ears and bark. And besides, she know she's got big bad Marta nearby as backup. Then I'm Going on Break! © Copyright 2009 FarmgirlFare.com, the off-duty foodie farm blog where Daisy and Marta, our livestock guardian dogs (who can get through/around/over/under/in and out of anything), did an excellent job watching over the sheep (as well as the rest of the farm) while we were away last weekend (me to Farm Aid 2009 and my hunky farmguy Joe, sadly, not to Farm Aid 2009) and, despite what it looks like here, did not run off the second I got home (well, not far off at least). Off To Do Some Live Blogging at Farm Aid 2009 in St. Louis! As I mentioned a few weeks back (what the heck happened to September? ), I'm going to be at the Farm Aid 2009 concert tomorrow doing some live blogging for the Farm Aid website. I'm so excited! There's going to be an incredible lineup of artists performing, plus the HOMEGROWN Village where concertgoers can get their hands dirty and learn about food production, growing your own, composting, how farmers care for the environment, beekeeping, and more. And of course there will be all kinds of fabulous food from local and family farms—which is one of the things I'll be blogging about. I'll also be spending some time in the FarmYard, a special place in HOMEGROWN village where farmers and concert-goers can meet, greet, and exchange a story or two throughout the concert day. If you're in the St. Louis area, a very limited number of reserved seats for Farm Aid 2009 Presented by Horizon Organic have just been released. Tickets are available at livenation.com (click here), at the Verizon Wireless Amphitheater Box Office, by calling (877) 598-8703, or at participating Blockbuster stores (visit livenation.com for list of locations). If you're not in St. Louis you can still enjoy the concert! It'll be broadcast live on DIRECTV's The 101 Network, live on FarmAid.org's Webcast, and live on Willie's Place on Sirius XM Radio. Click here for more info. And check out the just released video of Willie Nelson & Lukas Nelson talking about Farm Aid 2009 here. Pre-concert events include The Homegrown Urban Country Fair in St. Louis today from 10am to 2:30pm at the Tower Grove Farmers Market. This hands-on, interactive and educational festival features exhibits, workshops and demos celebrating modern homesteading and how we're connecting to good food, farmers and the earth, and great live music. You can read more about it here. Tonight there will be a public briefing called 'A Farmer/Urban Connection,' which will run from 5:00 - 6:30pm at the First Presbyterian Church, 7200 Delmar Blvd in St. Louis. Farm Aid, Missouri Rural Crisis Center, and other local, regional and national family farm organizations will discuss the challenges and opportunities facing family farm agriculture. Learn about how you can use your voice to push for a vibrant 'family farm' food system that builds thriving rural economies, strong communities, and resilient ecosystems to nourish us for generations to come. This is a free event open to the farmers, non-farmers, and all others interested in supporting family farmers. Click here to RSVP. © Copyright 2009 FarmgirlFare.com, the rushing around trying to get on the road foodie farm blog where we can't think of anything better than combining great music, great food, and a really great cause—keeping our family farms. Thanks for your support!